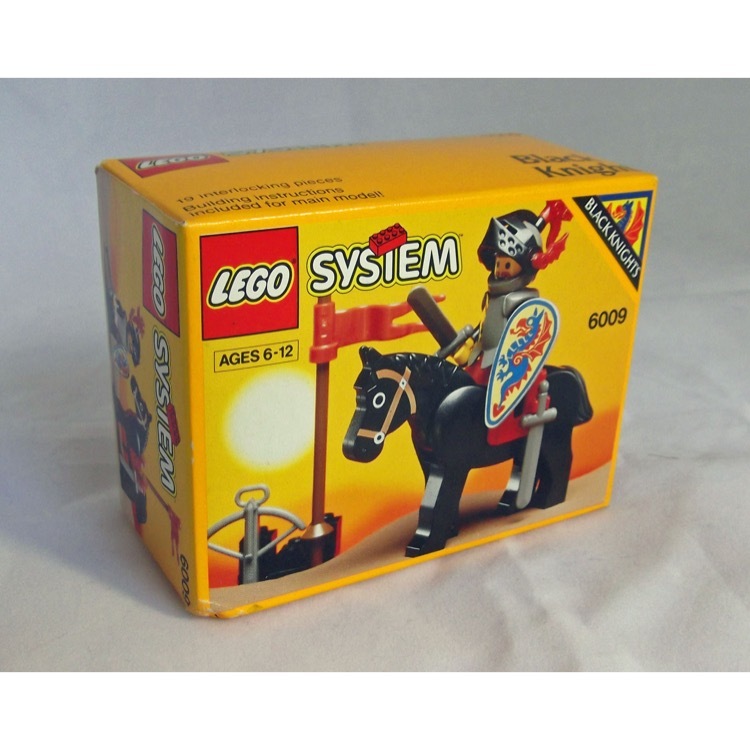 This is a BRAND NEW set of LEGO® Castle: Black Knights 6062 Battering Ram from 1997. This set is brand new, however 1 of the seals is broken. All the contents inside are brand new and still sealed in the original polybags. We have shrink wrapped this set to provide further protection and maintain the integrity of the box. The box is in good condition with minor shelf wear and sticker damage on the front upper right hand corner. 233 pieces and 6 minifigures©. 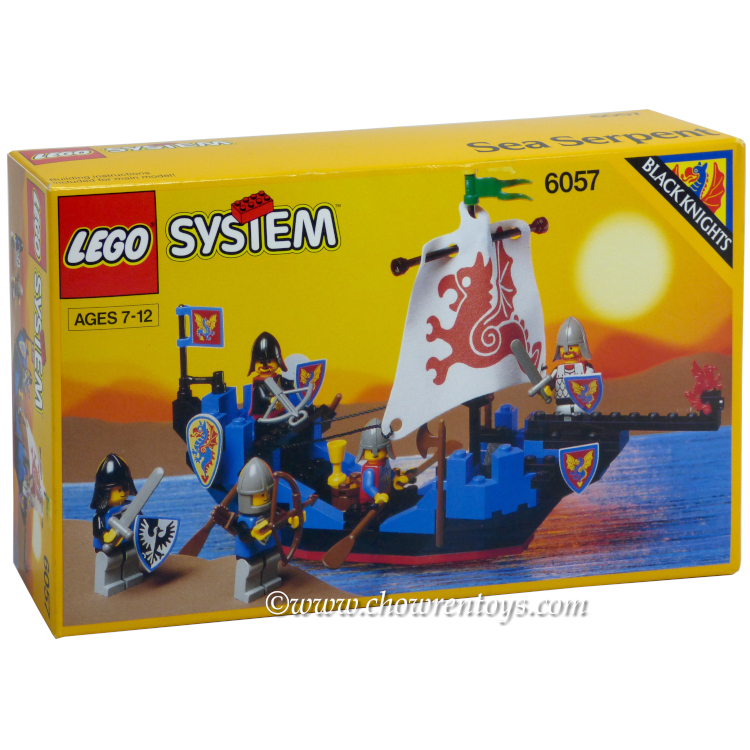 This is a BRAND NEW set of LEGO® Castle: Black Knights 6059 Knight's Stronghold from 1990. This set is still factory sealed and the box is in very good condition with minor shelf wear. 221 pieces and 5 minifigures©. This is a BRAND NEW set of LEGO® Castle: Black Knights 6057 Sea Serpent from 1992. This set is still factory sealed and the box is in rough condition with shelf wear and creases. 117 pieces and 5 minifigures©. This is a BRAND NEW set of LEGO® Castle: Black Knights 6009 Black Knight from 1992. This set is still factory sealed and the box is in very good condition with minor shelf wear. 19 pieces and 1 minifigure©. 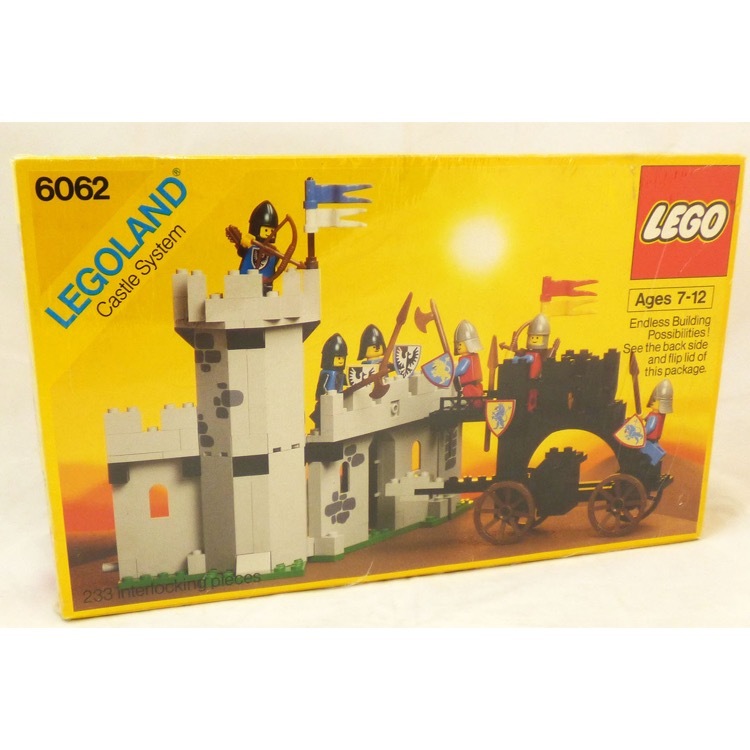 This is a BRAND NEW set of LEGO® Castle: Black Knights 6059 Knight's Stronghold from 1990. This set is still brand new, however 1 of the seals is broken. All the contents inside are brand new and still sealed in the original polybags. The side with the broken seal does not appear to have been opened. 221 pieces and 5 minifigures©. This is a BRAND NEW set of LEGO® Castle: Black Knights 1917 King's Catapult from 1998. This set is still factory sealed, however the box is in rough condition with minor shelf wear and a dent on the top. 18 pieces and 1 minifigure©. 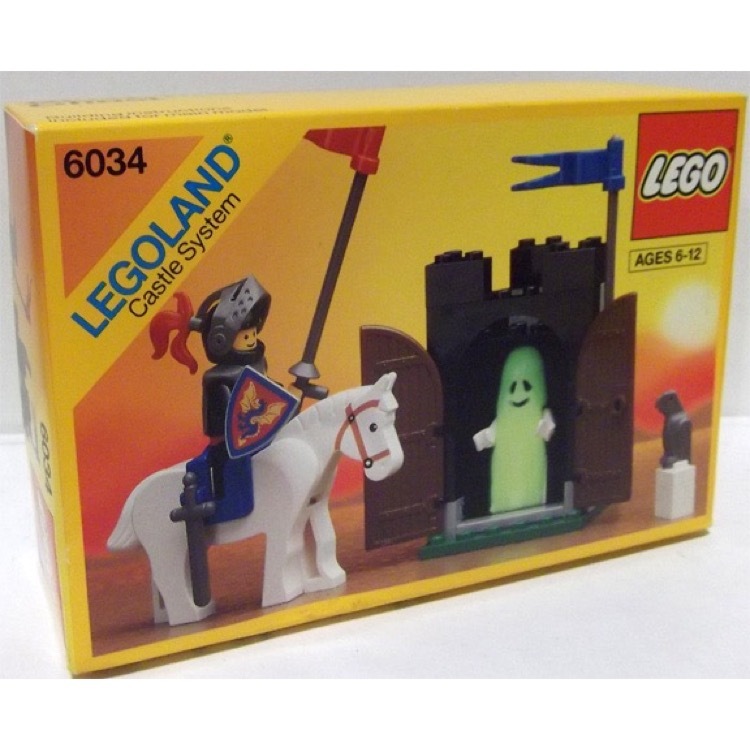 This is a BRAND NEW set of LEGO® Castle: Black Knights 6034 Black Monarch's Ghost from 1990. This set is still factory sealed, however the box is in rough condition with wrinkles, creases and shelf wear. 49 pieces and 2 minifigures©. This is a BRAND NEW set of LEGO® Castle: Black Knights 6057 Sea Serpent from 1992. This set is still factory sealed and the box is in very good condition with minor shelf wear. 117 pieces and 5 minifigures©. This is a BRAND NEW set of LEGO® Castle: Black Knights 6057 Sea Serpent from 1992. This set is still factory sealed, however the box is in rough condition with creases and minor shelf wear. The fron right side of the box has been pushed in. 117 pieces and 5 minifigures©. 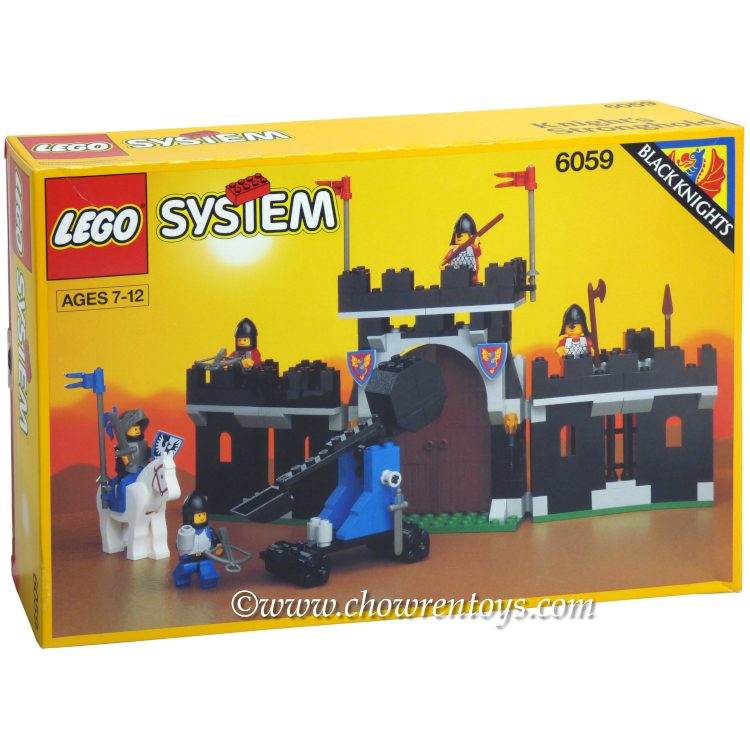 This is a BRAND NEW set of LEGO® Castle: Black Knights 6059 Knight's Stronghold from 1990. This set is still factory sealed, however the box is in rough condition, the front of the box has been pushed in and there is staining on the front of the box, there are also, creases and moderate shelf wear. 221 pieces and 5 minifigures©.